Understanding the fees and unique features on crowdfunding sites and fundraising websites can help you choose between the hundreds of options. 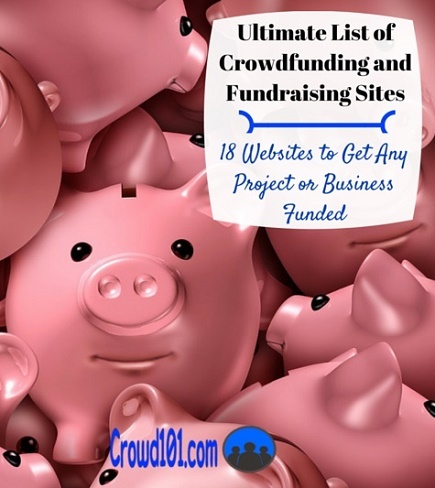 There are hundreds of other crowdfunding and fundraising websites to meet your campaign goal. Understanding the fees and unique features at each will help you take full advantage of the boom in alternative funding. You see, there’s so much more to successful crowdfunding than hopping on a site with lots of traffic. It’s about finding that crowd that is going to be interested in supporting your project. I've updated this list of 18 crowdfunding platforms and fundraising websites with a list of sites and crowdfunding resources to help you raise money online. Besides fees and the types of projects allowed on these crowdfunding sites, pay attention to which categories seem to do the best on the site and which resource tools you can use to make your campaign go smoothly. I have included a rough classification of the best crowdfunding sites and fundraising websites at the bottom of the post. It’s not an exact classification but might help you decide which crowdfunding website or fundraising site is best for your needs. Please use the comments section at the end of the article to add any crowdfunding platforms or fundraising websites that didn’t get listed. I’m going to start off the list with a few crowdfunding websites specifically for non-profit and social crowdfunding. Make sure you scroll down through the list though and check out other sites. Each has specific types of campaigns for which it is best suited. This idea of finding the best crowdfunding website for your campaign is important but overlooked by a lot of people. It’s not just about whether a site has a lot of monthly traffic but whether that traffic is going to be interested in your campaign. DonateKindly is the leading free online donation tool used by nonprofits across the world. It's designed specifically for nonprofits who have a focus on online fundraising directly through their own website. Its simple yet highly customizable donation forms enable you to easily accept donations directly from your supporters directly on your website. DonateKindly offers free donation tools. Its most widely used tool is its online giving platform which allows your organization to easily add a free donation tool to your website. DonateKindly is different from pretty much every online donation tool in that it's completely free for a nonprofit organization. There's no subscription platform fee and the only fee charged to your nonprofit is the standard credit card processing fee of 2.9% + $0.30 per transaction which goes directly to the credit card companies. DonateKindly is the most cost-effective donation tool out there. Launch Your Free DonateKindly Fundraisng Tool. Fundly is a crowdfunding website that’s helped raise over $330 million. Designed specifically for individuals and nonprofits, Fundly’s simple crowdfunding model allows campaign creators to instantly build a custom donation page and accept donations directly from supporters. Fundly, launched in 2009, was one of the first crowdfunding websites and has helped pioneer the industry. From easily customized fundraising pages which help you tell your story with images and videos to multiple social media integrations which help you promote your cause, Fundly is designed to help you raise funds quickly. And Fundly is not an all-or-nothing service so you don’t have to hit a specific goal in order to receive the donated funds. Fundly, which provides individuals with an easy way to raise money for any cause they care about or need to raise funds for. FundlyPro, which provides nonprofits with robust tools to run a successful crowdfunding / peer-to-peer fundraiser for their organization. It’s free to start a campaign with Fundly. You only incur a fee if you successfully raise money, in which case Fundly charges a 4.9% platform fee in addition to the standard credit card processing fee of 2.9% + $0.30 per transaction. The platform fees also go down if you run a big fundraiser. YouCaring offers crowdfunding for personal and charitable causes and charges no fee to fundraising organizations. That could make a huge difference compared to the 5% fee charged on the GoFundMe platform. For example, you would lose $250 in fees on a GoFundMe campaign versus no fees charged on YouCaring. The site specifically offers categories of Medical and healthcare costs, Memorial & funeral costs, Education & tuition fundraising, Family & adoption costs, Faith-based service projects, Pet & animal expenses, Community or Cause. YouCaring does not permit fundraising for legal defense, litigation, bail bonds or other legal matters. YouCaring advertises that it doesn't charge admin or service fees but be aware that during the donation process YouCaring is going to ask your donors to donate to the website to support operations. PayPal and WePay offer third-party payment processing and charge 2.9% plus $0.30 per transaction. The largest crowdfunding site for products with more than 13 million visitors every month, Kickstarter hosts crowdfunding campaigns from comics and crafts to technology and Theater. The site does not allow campaigns for social causes so you’ll need a product or event to promote. Under the flexible funding model, Indiegogo charges a 9% fee on the funds raised. If you reach your goal, you get 5.0% back, for an overall fee of 4%. Fees for the all-or-nothing model are a flat 4% of contributions. PayPal or credit card processing is available with fees ranging between 3% and 5% of the amount. Indiegogo offers a 25% discount on their platform fees for any campaign raising funds for a nonprofit institution with a 501(c)(3) registration in the United States. Contributions for these campaigns are tax-deductible. Syndicates – An angel or fund forms a syndicate, picking which investments it likes and wants to support. Private investors then support the syndicate to invest indirectly or directly in the separate projects. Self-syndication – Allows accredited investors the opportunity to make direct investment in individual campaigns. CrowdRise allows you to create a fundraiser online for your favorite cause. The fundraising website runs on the flexible funding model where you keep all pledged donations. The site is one of the largest for social cause crowdfunding and used by some of the largest non-profits including the Red Cross, UNICEF and the Boston Marathon. Crowdrise offers a unique point system that helps track the impact charities are making through their reporting numbers. The Featured Plan includes a $49 per month fee but reduces the donation fee to 4% plus credit card fees. The Royale Plan charges $199 per month but lowers the donation fee to 3% plus credit card fees. Fundable is one of the few crowdfunding platforms to offer both equity crowdfunding and rewards-based crowdfunding. One of the most interesting features on Fundable is that it charges no fee associated with how much your campaign raises, i.e. the 5% fee on Kickstarter. This means you keep any money pledged and makes the site more attractive to those looking to raise a large amount. Two ways to Fundraise – Equity-based Fundraising and Rewards-based Fundraising. Fundable charges $179 per month plus a merchant processing fee of 3.5% + $0.30 per transaction for rewards-based crowdfunding. The site charges $179 per month for equity crowdfunding campaigns. SeedInvest is a platform that enables equity-based crowdfunding by accredited investors in startups. Crowdfunding campaigns must reach their funding goal to receive any funds. Companies should expect to take a minimum of 60 – 90 days to complete equity crowdfunding. The crowdfunding site charges no investor fees and allows you to invest alongside with institutional investors. 5% placement fee, to be charged on the value of the fundraising upon successful completion. Between $3,000 and $5,000 in due diligence, escrow, marketing and legal expense reimbursements. 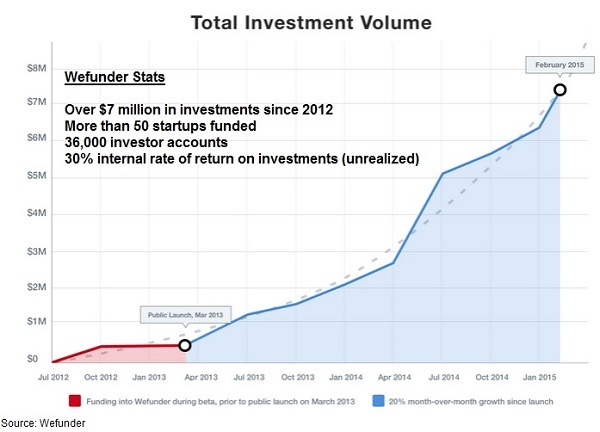 WeFunder is another equity crowdfunding site but offers lower minimums for investment. You still have to be an accredited investor but can invest as little as $100 for an individual company. Startups receive most of the funds committed, minus an admin fee. Investors also pay a $10-$75 admin fee on top of their investment. WeFunder charges 10% carried interest, and a nominal admin fee between $2,000 to $4,000 upon the successful close of the funding. CrowdCube is a U.K. crowdfunding website backed by Balderton Capital and more than 400 private investors who have collectively invested more than £1.8M across multiple rounds of funding. You can find investment opportunities in a variety of industries or raise funds for your business. Currently, they only support British businesses. Equity – Raise investment in exchange for an equity stake in your business. Mini-bonds – Give the crowd the opportunity to lend you expansion capital and share in your growth. GoFundMe is one of the most popular fundraising websites for personal fundraising causes. The platform offers a little more personalization in campaigns and three models for fundraising: personal campaigns, charity fundraising and all-or-nothing campaigns. Under the personal campaign model, you set up your campaign and request donations. This is a good option for those looking to fund medical expenses, memorials, and travel because you don’t have to offer rewards. For personal campaigns, you do not have to set a deadline or funding goal. The charity model allows you to choose one of the non-profit organizations listed on the site and promote it through your social network. Crowdfunding promotion is one of the toughest parts of crowdfunding so it's nice to have another option. 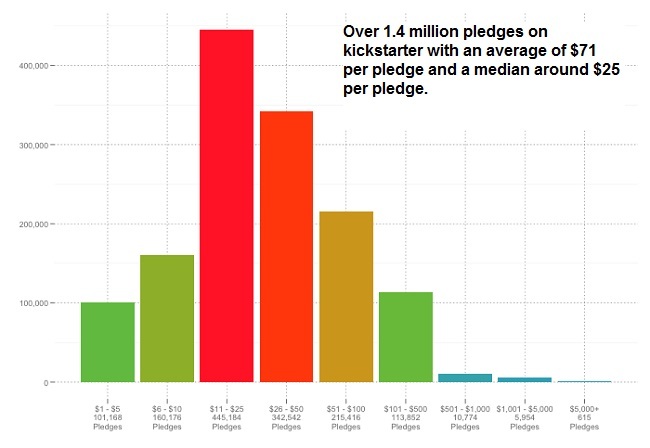 The all-or-nothing campaign model is similar to Kickstarter where you create a crowdfunding campaign and offer rewards for backer contributions. In the United States, GoFundMe deducts a 5% fee plus a processing fee of about 3% and $0.30 from each donation you receive. International fees range from 6.9% to 7.9% depending on the country. Charities pay a 5% platform fee and a 4.25% fee to FirstGiving. If you do go with a non-rewards based fundraising website like GoFundMe, make sure you check out our mega-resource of 33 expert ideas to boost fundraising ideas and crowd campaigns. Patreon was launched to enable fans to support their favorite creators and is geared towards ongoing projects of music, video and other creative projects. The site offers a really unique model in that backers pledge to support creators on an ongoing basis, usually for each project, until the backer cancels the promise. Pledges are generally for smaller amounts than the one-time donations on other crowdfunding sites but can grow over time with multiple projects. Patreon can be a great way for those in the creative space to fund their ongoing projects without having to constantly worry about raising money for each individual campaign. Rewards are offered but are usually only deliverable one time. Patreon charges 5% on pledges with credit card processing adding another 4% off the donation. Beyond these fees, creators also pay billing partners for payment processing between 2% and 5% of the amount. CircleUp is an equity crowdfunding platform that connects accredited investors with innovative consumer and retail companies. Companies must typically have substantial revenue (> $500,000 annually) or other indicators of potential success and are evaluated by private equity investors before being allowed on the site. Average funding time is between two and three months and funds can be raised through convertible debt or equity. Companies pay a commission to FundMe Securities LLC, a wholly owned subsidiary of CircleUp. Minimum investment size is $1,000 and up, depending on the offering. There are no fees for investors and your investment is returned if the company fails to meet their target funding. An interesting feature of CircleUp is the ability to follow “circles” based on an affiliate company, usually a private equity analyst or an investment firm. The affiliate publishes their opinion on deals and investors are allowed to co-invest through a fund managed by the affiliate. Investors pay carried interest to be a part of the fund. 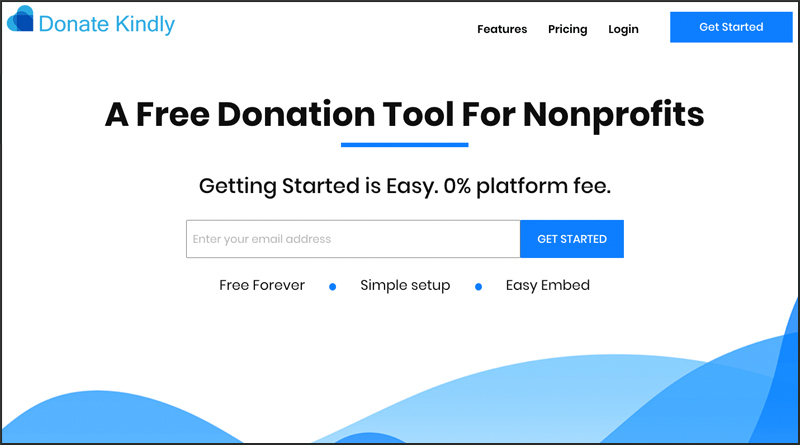 DonateKindly is the leading free fundraising tool if you're looking to add online giving options to your website year-round. Fundly is the most popular crowdfunding website for nonprofits with many celebrities having run crowdfunding campaigns on the platform. 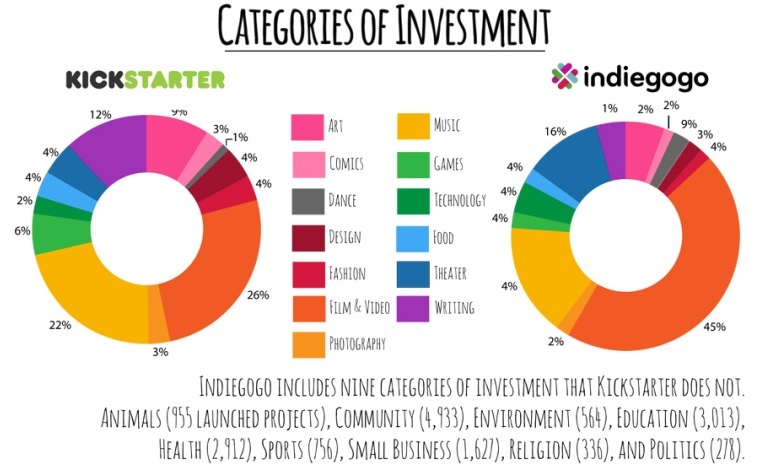 Kickstarter and Indiegogo are by far the largest crowdfunding websites in terms of traffic and popularity. That can go a long way in attracting a crowd to fund your campaign. Kickstarter only accepts rewards-based campaigns while Indiegogo is a little more lenient on requirements. It’s a good idea to check one of these two out unless another crowdfunding site has a specific feature in which you’re really interested. 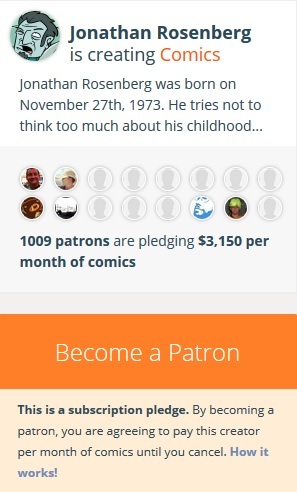 Patreon offers a unique crowdfunding model for people with recurring funding needs like artists, writers and others that create multiple projects regularly. If you’ve got an active group of people that regularly follow and support your work, this site is definitely worth checking out. Even before the SEC clears non-accredited investors to invest in crowdfunding projects, equity crowdfunding has become a great source for business funding. As with traditional angel and venture capital funding, you sell an ownership stake in the company for funding. Fundable offers rewards-based crowdfunding as well but one of the rewards-specific platforms would probably be better suited for a non-equity campaign. The upside to equity crowdfunding on Fundable is that you pay only a monthly fee instead of a percentage of funds raised. SeedInvest, CircleUp and WeFunder are also equity crowdfunding websites with fees slightly lower on WeFunder. CircleUp has a strong investor community and has developed the investing circles concept on its platform. This might help to reach larger investors and influencers for your equity campaign. For those business owners in the U.K., CrowdCube is a good choice for equity crowdfunding. The opportunity to raise money through equity funding or through bonds helps to match investor needs and risk appetite. Good article – well done- very helpful! Thank You! The article was well written and very informative information for those wanting to learn more about crowdfunding options in the market. I wanted to make a comment on one of the alternatives as well for those looking to build their own crowdfunding websites. Thrinacia is whitelabel crowdfunding software built for those wanting to make their own crowdfunding website. It offers a fully customizable experience with powerful features. Yet is easy and simple to use with great support. The best platform for these kind of social cause campaigns is GoFundMe since you don’t have to offer any rewards to supporters. Make sure to reach out to all your personal network, family and friends. Good article. Very informative and useful for crowdfunding. Thanks for sharing it. This post is awesome, it was one of the first ones everyone should read to inform themselves better on crowdfunding. I’m putting together a crowdfunding campaign and read your book “Step-by-Step Crowdfunding”. I’m still debating on which platform to use. The purpose of the campaign is to bring in more funds to a startup company. We don’t want to give up equity so I’m pretty much debating on Kickstarter and Indiegogo. We are based in the US but I’m not quite sure if Kickstarter will approve our project. Another concern is the flexible or fixed dilemma. One brings certainty of some funds while the other creates security and urgency for backers. One last thing is, what task is the most budget draining in a crowdfunding campaign? I appreciate any insight you can provide. 1) Plan your budget so that the flexible/fixed goal doesn’t matter. Set your goal at about four or five times what you absolutely know you can raise on the first day through pre-launch. That will get you on Kickstarter/Indiegogo radar for a hot campaign and you shouldn’t have a problem meeting your goal. 2) Outreach and marketing is usually the big budget buster, establishing connections and spreading the word. Start with personal connections and build a strong network that will help do the legwork for you. A strong team of initial contacts is how most campaigns go viral. Good luck on the campaign! Great list! Thank you really much! We have a small pet grooming salon in a rural area we opened 3 years ago. Our client base has grown beyond our expectations and we desperately need to build our own building designed to better meet the needs of our community. In a rural area like ours stray and abandoned animals desperately need a rescue facility which is what we want to incorporate. We can’t afford to do this without help however giving up equity would not leave enough for operating costs and a reasonable profit to sustain us. What suggestions might anyone have? Sounds like a crowdfunding campaign could help you raise the money. You’ve already got the community and customer base so raising the money will be much easier than starting a campaign from scratch. Your rewards are going to be discounted services, naming rights and other products/services related to your business. You’ll want to pre-launch you campaign to get an idea of how much money you can raise but it shouldn’t be a problem if you follow the process. Check out Step-by-Step Crowdfunding on Amazon Kindle or paperback for the 17 steps. Good luck. Joseph, what about music related crowdfunding platforms such as show4me.com and pledgemusic.com. I understand that these are niche crowdfunding platforms, but music is the top category on most crowdfunding sites. These two platforms are almost the same but the only difference is that Show4me platform is much better for concerts and gigs crowdfunding. The site has very good funding model specially for concert crowdfunding. So I should say that for music crowdfunding I would choose one of these two. For concert crowdfunding campaign I would choose Show4me without any doubts, for other music related campaigns I would also consider one these two. My personal opinion is that using non-focused platforms can be a big frustration for fundraisers. Joseph, I would be happy to see your article about TOP niche crowdfunding platforms. Everyone knows that crowdfunding becomes more and more allocated and directed from day to day. Thank you for good article! Both look like great crowdfunding options for music-related campaigns. Thanks for the heads-up David. Will have to look at them a little closer and do a review. Hi, I belong to a church and we want to raise money for the poor kids in the north of Brazil, where there is a sports project, needing basic things such as water, energy, sports goods and facilities, transportation, coughing, food and bevarage, etc. In order to taking them out of streets where they learn crime, etc. In the future we also plan to build a school. What plattaform do you suggest me? Thank you. The social crowdfunding sites are best for this kind of campaign. Check out the fundraising sites in the list like GoFundMe, Causevox and other charity sites. Don’t forget that there is still the crowdfunding process even for non-profit campaigns. Good luck. I recently found booster.com which has teamed up with customink.com to have campaigns around a shirt/sweatshirt/hoodie design. I wish they would tie in other products from customink, but they have to start somewhere, right? I will be doing a campaign to raise funds for training et al for a much needed service dog. Here’s something that’s not clear to me – as a start-up that’s considering crowdfunding: How do you classify the money that you raise through the rewards-based crowdfunding? Specifically, is it a gift, a loan, income, or something else? How would the start-up account for expenditure of the funds received? (If you are a non-profit or raise equity based funds, I understand, but not as a for-profit, raising reward based funds). Thank you. Good question and one that trips up most crowdfunding campaigns. Any money you raise through crowdfunding is considered regular income by the IRS (or most tax regulators). If it is for a business then you would consider it start-up capital that YOU provided into the business since the donors do not have a claim to it. That’s why it’s so important to keep track of all your expenses and everything you spend on your campaign because you’ll need to use it against the taxes you pay. Good Article, thanks. What if monies raised are going directly to let’s say to an adoption firm or lawyer, would that still qualify as income for the IRS? It’s still counted as income. If it went to an organization with a 501c3 status then you could write it off on your taxes as a charitable donation but then you have to itemize your deductions. Thanks for the question. Hello. Any thoughts on which sites offer the simplest or best transaction to collect the funds, and which ones are most successful in a veterinarian life saving situation? I can’t decide between youcaring and giveforward, if you recommend those for veterinarian costs to save the life of a dear, young rescue dog (now our family member) diagnosed with a rare cancer tumor. I read negative things about wepay, but I don’t have any expertise with this. Perhaps you have a better option, or can clarify. Thanks for any thoughts. I don’t have quite as much experience with YouCaring or GiveForward as I do with GoFundMe. I have heard that GiveForward is a good site and easy to use. For visitor traffic, it’s hard to beat GoFundMe for non-profit causes. They are also pretty easy to work with on collecting funds. Great article, I was just wondering if you could direct me. I am Hong Kong based with a company registered back in Australia. I have invented a sports product and built a sports brand around it from the trade marked name Eliminator. The trademark is registered in 7 countries and has a range of products ready to launch. I am hoping to rival all the major players in the industry but need help with funding. I am happy to give up equity but would like your thoughts on which may be the best platform for this type of crowdfunding. International business owners do not have much of a choice when it comes to crowdfunding platforms. At the moment Kickstarter is only in some countries, but fortunately for Martin, Kickstarter is in Australia and Hong Kong. However, to simply say go with Kickstarter or Indiegodo is not accurate, because you really have no choice in the matter. 🙂 Interestingly, if you are a backer, you can back from anywhere in the world on Kickstarter. However, as the project creator you can only be in the US and some other 19 countries. Hello Joseph, Thanks for your posts about the crowdfunding and marketing techniques. All the posts are very useful for new crowdfunding campaigners as well as crowdfunding people who failed to get the success. Keep posting these post, BTW I’m a regular visitor of your blog. Thanks Crowdnuke. Love following crowdfunding and posting to the blog. It’s really helping a lot of people raise money for some important projects. They allow people to review different crowdsourcing sites in different categories such as design, content, funding, accommodation, services, and education. It can be hard to tell the merits of one site vs another one and The Crowder really helps with that! Thank you for this very helpful list. I have a potentially huge social benefit project – a crowd-wisdom collaboration to create the template for a new economic model. From what you have said, Fundly and Crowdrise look the best fit. I am wondering if it makes any difference if the project is long-term and the amounts in six figures? I also would like to know if it is possible to work with more than one site? Jon, It’s usually best to focus on one crowdfunding site though with social projects you can work fundraise on more than one. Longer-term, high-dollar fundraising projects are best split into more manageable chunks so you can show donors you’ve had success crowdfunding on the little projects. How would you use Crowd funding for starting a restaurant? Your best bet would be to make it a very grassroots crowdfunding campaign. Reach out to local groups and on local websites. Rewards would be things like tickets to a private opening, special theme date nights at the restaurant, and gift certificates…and anything else you could think of. Bob, there are quite a few crowdfunding platforms specific to real estate development. Fundrise comes to mind immediately as well as RealtyShares and RealtyMogul. Would have to be an equity deal rather than rewards. Thanks for the wonderful and incisive post. I am currently based in the United Kingdom and plan on raising funds for a start-up that will be implemented in Africa. Its a hotel booking website and we plan on expanding to the whole of Africa and all other continents . Any ideas on how to go about crowd funding this start up ? Your project is may be best suited for equity crowdfunding since it is for a for-profit company. Many of the U.S. equity crowdfunding sites are limited to U.S. corporations but check out the recent post on 7 equity crowdfunding sites for the new crowdfunding rules. There are also international crowdfunding sites that are open to all. A rewards-based campaign on Kickstarter or Indiegogo could be a possibility but you would have to think about what to offer backers, maybe hotel stays and vacation deals if you could negotiate something with providers. Good luck. I agree. I have used GiveSendGo and it was awesome for crowdfunding. Would recommend that or Fundly.com. A 501c3 is a great start for crowdfunding because people know their contribution is going to a good cause and is tax-deductible. You’re right that you could also start with a small crowdfunding campaign now to raise money for the process. If it’s a good cause then people will support it on its way to a charitable organization. Great article and the most in-depth I’ve read when researching crowd funding! My business idea is an app. I am not a developer, just an idea for an industry specific app. Would either of the app funding pages pick up the idea and help me build it? Or am I better off using my own developer and putting it on a different crowd funding source? The 2 am considering are indiegogo and rockethub. I have received quotes from app builders so know the cost and that is what I was planning on asking for. Do you suggest asking for a percentage above that figure to cover the funding costs? Thank you in advance for your response. Hi Alison, The app crowdfunding sites have the benefit of being a targeted universe but really lack the reach of the other sites. If you already know the development process and have been in touch with a few developers, I would say go with the larger sites first (my preference would be for Indiegogo). You can always go back to the App crowdfunding sites later if the general crowdfunding doesn’t work out but the same can’t be said for vice-versa (you can get locked in to their distribution on the app crowd sites). I’m not really familiar enough with app development or pricing to say what you should do on setting a funding level but you need to make something out of it as well, especially to cover other expenses. Thank you for providing some very useful information in regards to crowdfunding, I really appreciate it. I am about the navigate the waters of crowdfunding, and I learned a lot thanks to your article. Wish me luck…fingers crossed. What is your opinion on Fundable? Also, 18 months strong of traction/ momentum I wanted to know if I could be of any value to you, would it be possible to get some more Qs answered? Thank you again Joseph. Great Article. Hi Angel, I haven’t followed Fundable much but definitely a legit platform. The idea is that some of the smaller platforms may be better if they target a very specific group that clicks well with your project. Always open to answering questions. Do you have any suggestions as to where I should be putting my campaign. It’s travel, so I know it makes it difficult. I am currently using PlumFund, which is a nice site, but I’m going no where fast. I have had close to 60 shares and still have no contributors. Should I just delete this and go to a different site? Here is my story, description, pitch, or whatever they choose to call it. Short Story: I want to visit Georgia, so that I can tour the sets of Vampire Diaries and The Originals. Longer Story: In April 2014 I was diagnosed as having Bipolar Depression along with Severe Anxiety. I didn’t handle the diagnoses very well. I just turn on one of these and it helps me relax. As strange as it sounds, I am emotionally invested in these two shows. Hi Cynthia, I haven’t seen much on PlumFund but it is definitely one of the smaller crowdfunding sites. If you can put together a reward system, i.e. a walking tour of the trip and Vampire Diaries site, you could put the campaign on Kickstarter. If not, then GoFundMe would probably be a better bet. The biggest thing though isn’t the site but your own pre-launch marketing. You really need to reach out and develop the fundraising campaign, starting with everyone you know. It is amazingly easier if you get that initial little push from friends and family. This was really, really helpful. I am thinking of launching a consumer service business in the fitness industry. It’s been written (or I think I’ve seen it written!) in multiple places that rewards based campaigns are better for small raises (=<$50k). If I believe that the rewards we'd offer (deeply discounted memberships) could result in a significantly higher raised amount (up to even the very low seven figures), is there any reason other than my over-exuberance why a rewards campaign couldn't yield this level of success? Will, There are certainly examples of rewards crowdfunding campaigns raising into the millions of dollars but it is the exception and not the rule. The vast majority of campaigns raise less than $10,000 and only about 1-in-100 raise more than $100,000 in funding. Best is to set an achievable target and then stretch goals above that.